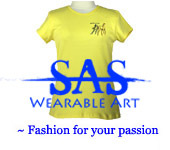 Wearable art is becoming more popular as the technology for transferring original art onto choice apparel is improved. Today the ability to digitally reproduce fine art onto apparel in the form of embroidery and other methods allows for detailed and colorful reproductions on clothing that captures the essence of the original and gives it a wearable platform for display. At Stubbs Art Studio we’ve taken the updated technology of digital reproductions and applied it to a number of our favorite equine themed original artworks to produce fabulous embroidered clothing including polo sports shirts, tote bags, tee shirts, sweatshirts and outerwear. Unlike company logos and other common embroidered images our artwork reproductions capture the life, emotion and aesthetic appeal of the original piece of art and transfers it beautifully and perfectly onto your choice of garment. We’ve taken a personal interest in the majestic and noble horse and find the subject matter to be without equal when it comes to animals and art. Two of our favorite paintings are used to design the embroidered images on wearable art clothing; 4 Horses and Colts Playing. These two original works of art allow for a pinpoint recreation using colored threads hand-picked by the original artist to match as closely as possible the colors used in the authentic water color or acrylic paintings. Some thread colors are altered slightly to pick up on subtle nuances of color and shading depth and the embroidery features the reflection of varying stroke widths of the paintbrush and gradient color changes. With equine themed wearable art apparel you not only get a beautiful and digitally enhanced reproduction of fine art but also a unique garment that shows off the artwork and shares our love of horses and the legacy associated with this regal animal. The images that are recreated can be added to your choice of sports shirt, tee shirt, sweatshirt fleece pullover, fleece outerwear, tote bag and casual wear tops for men, women and children. All of our clothing is made from 100% Ultra Cotton with the obvious exception of tote bag and fleece pullovers. Soft, comfortable and stunningly unique our collection of equine themed wearable art looks great and can be used to match many casual outfits for any season.